This article is sponsored content brought to you by A-dec. The widespread adoption of digital imaging in dental surgeries has revolutionised the speed and accuracy of diagnosis and treatment planning, and greatly boosted case acceptance. But how do you select the right equipment without getting bogged down in the technology? A-dec Marketing Manager, Simon Taggart, says dentists can save themselves a lot of headaches by purchasing from one manufacturer who can offer a seamless digital workflow. “The last thing you want is incompatibilities between different pieces of equipment. This can lead to finger pointing and lots of frustration getting it all to work together as intended. Acteon’s Red Dot award winning X-Mind Unity™ X-ray generator and inbuilt Sopix2 digital sensor with ACE technology reduces radiation by up to 50% according to patient morphology, ensuring excellent images every time together with prolonged sensor life. 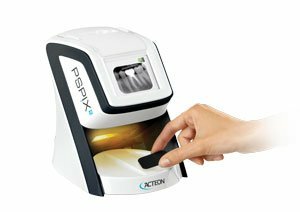 The PSPIX2® is the fastest and most compact phosphor plate scanner available, processing images in just 12 seconds and being fully networkable throughout the practice. Different size phosphor plates also make the PSPIX2 more suitable for smaller and younger patients. Acteon’s SoproLIFE® and SoproCARE® diagnostic intraoral cameras with their unique ‘caries’ and ‘perio’ functions use fluorescence technology to highlight early onset caries, plaque build-up and gingival inflammation often not visible to the naked eye or on X-rays. 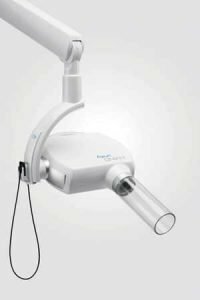 Sopro cameras add confidence to diagnosis and greatly improve case acceptance and patient referrals. Tying it all together, Acteon Imaging Suite (AIS) software provides a seamless digital workflow by acquiring images from Sopix digital sensors, PSPIX2 scanners and Sopro intraoral cameras for speedy analysis. AIS leverages Acteon’s superior image quality to clearly and accurately show morphology and anatomical relationships, enabling dentists and specialists to plan safe and effective surgical procedures and export data to help tailor implant sizes and other appliances which can be designed using a digital workflow.